MultiSea II Stabilizer Control System User‐Friendly Reliable Performance Active Roll Stabilization Hargrave Custom Yachts 100’ La Marchesa equipped with the Naiad MultiSea II Stabilizer Control System and IHS. Naiad Dynamics, a pioneer in yacht stabilization with unparalleled experience, sets the standard for modern stabilization controls. The MultiSea II fin stabilizer control system provides superior performance over a variety of sea conditions. The electronic processor and motion sensors respond instantly to the slightest roll, correct static heel and automatically adjust to changing hull speeds. This versatile system is ideal both for new yachts, and for upgrading existing control systems. Proven Technology The MultiSea II precisely manages fin position over the widest range of hull speeds, headings and weather conditions. Using US Department of Defense restricted sensors, the MS II processes roll angle, velocity and acceleration measurements, and issues blended and optimized control commands to the fin actuator units in direct proportion to the roll tendency. As the MS II senses the slightest roll motion, the fins respond instantly and in exactly the proper phase and degree to neutralize the vessel’s tendency to roll, without over or under‐ correcting. Utilizing closed‐loop electro‐hydraulic control with continuous feedback, Naiad fins stop rotating the moment the roll tendency is neutralized, regardless of their position or the vessel’s speed at the time. At that moment the MS II then begins to anticipate the next roll. MS II controlled Naiad systems have been proven to automatically reduce roll motion by up to 90% over a wide range of operating speeds. 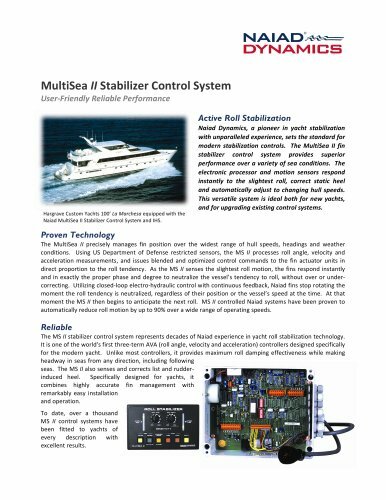 Reliable The MS II stabilizer control system represents decades of Naiad experience in yacht roll stabilization technology. It is one of the world’s first three‐term AVA (roll angle, velocity and acceleration) controllers designed specifically for the modern yacht. Unlike most controllers, it provides maximum roll damping effectiveness while making headway in seas from any direction, including following seas. The MS II also senses and corrects list and rudder‐ induced heel. Specifically designed for yachts, it combines highly accurate fin management with remarkably easy installation and operation. To date, over a thousand MS II control systems have been fitted to yachts of every description with excellent results.